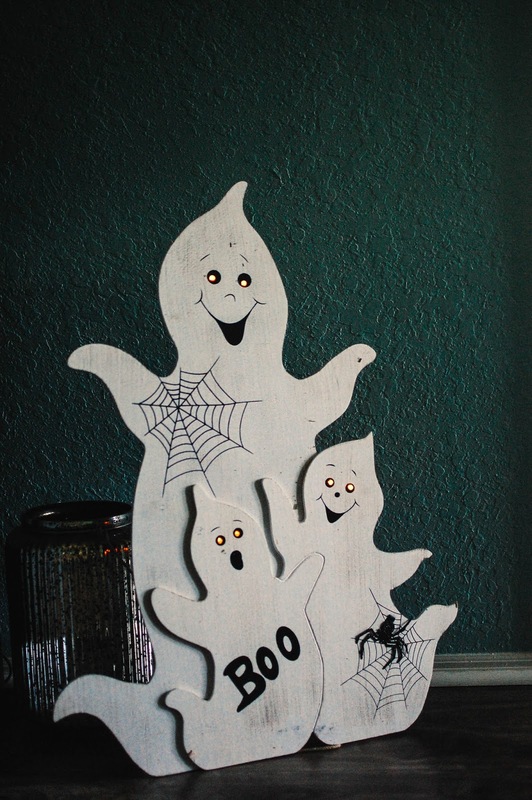 My mother-in-law gave me this cute wood cut ghost trio last year after Halloween, so this is the first year I have put it out. I love how the eyes light up. These guys and my crows are pretty much my only Halloween decorations. Still sans wreaths this year so far. I can't believe October is already halfway over! My next melting basket will have all my spooky Halloween scents in in so stay tuned for that. What are you melting? Do you decorate for Halloween? Any favorite items? Don't forget to check out my Fall Fun Series Blog Roll on the sidebar to visit the other lovely ladies participating in this series! That's adorable! Very cute ghosties. I am also without wreath this year - went to get my (admittedly pretty ragged-looking) Halloween wreath out of its closed storage to find it had gone all skunky-smelling, like dirty hair, grossly enough. I left it to air out for about a week and a half, and it held the smell, so I chucked it. Not sure I can be bothered to get another one this year. What's up with that? Thanks! I was really happy she gave it to me. I never even knew she had it. Cannot have a skunky smelling wreath. Ew. Yeah... I have had wreaths hanging on my doors for 12 years now. What is up with us?!?!? At this rate though... I am honestly going to just wait it out and get some at a deep post-holiday discount (I hope). That's IT? I shouldn't talk, since I went quite minimal this year myself. And it's funny because my favorite thing I have this year IS a wreath. It's a black and orange bulb wreath that I got on clearance last year at Target, like 90% or something. I KNOW!!!!! >_< Such a slacker. Maybe I will get some goodies from the Dollar Tree next year and spruce it up. Or Target after Halloween. They have a black meowing cat that I love. See... your wreath sold me. Maybe I can find something cute like that. We are a pair this year huh? Maybe next year we will be more in the spirit. I hope next year is better for both of us! I can't believe how blah I've been about fall and Halloween. I'm just not feeling it. There are so many other distractions for me this year. Bleah! I love those ghosties! I'm sure they fit right in with the rest of the fall decor you showed previously. Thanks! Me too! I have seriously fallen hard for them. Even my Mother-in-law came over and said how cute they look in our home. Meant to be. And free is the best LOL!